Hell no, we won't go... ISO! 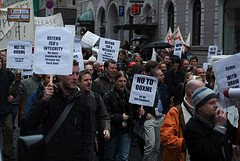 Norwegians take the to the streets to protest their country's decision (by one person) to vote for the OOXML fast track process. Apparently the chairman of the ISO Committee Norway is resigning in protest over the abuse of the process. There's a nice slideshow of the rally here. Photo credit: AndyArmstrong. Some rights reserved.